Baseball is a game that involves a lot of twisting, jumping, lateral and forward-to-backward movements. 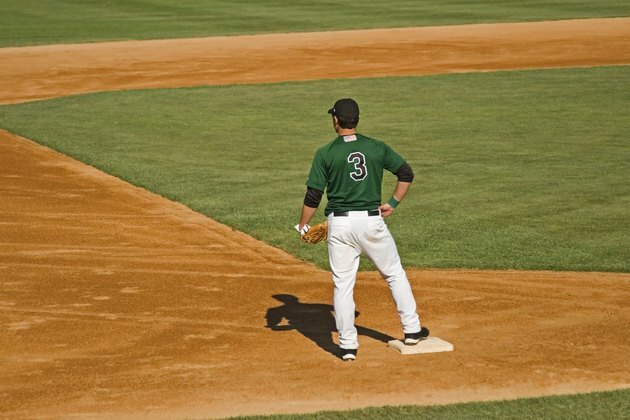 If you walk on to the field to perform these tasks without a proper warmup, you run the risk of pulling a muscle. Uncommon to popular belief, the warmup exercises involve more than pulling your arm across the front of your chest and holding for 10 seconds. That type of stretching is called "static." Although it has a time and place, the beginning of a game is not it. The warmup exercises should be "dynamic," which means they are in motion. This will get the body primed for the actual movements that will be seen in a game-specific situation. The first thing that should be done in a warmup is five to 10 short sprints that simulate the action you would see in a game. This will get the body's core temperature warmed up, and it will also increase circulation to the muscles. Start at the first base line. Sprint to second base, walk back and sprint again. Stand in a wide stance with your arms out to your sides and parallel to the ground. Bend forward and touch your right hand to your left foot. Come back up and then touch your left hand to your right foot. Alternate back and forth three to six times. Trunk rotations are done with your feet in a wide stance and your hands extended out to your sides and parallel to the ground. Rotate your upper body to the right, then rotate it to the left. Every time you rotate, try to go a little bit further. Go back and forth three to six times. Knee lifts loosen up the legs and the hip flexors. To do these, stand with your feet about shoulder width apart. Lift your right foot off the ground and bring you knee up to your chest. Lower it back down and bring your left knee up. Go back and forth three to six times. You can also do these in a walking motion. Squats loosen up the glutes, quads and hamstrings. To do these, stand with your feet about shoulder width apart. Bend your knees and lower your body slowly until your thighs are parallel to the ground, then stand back up. Go up in a fast and controlled motion. Do three to six reps.
To do walking lunges, take a long step forward with your right foot. Bend down until your front knee is 90 degrees and your back knee is about 2 inches off the ground. Come back up, step forward with your left leg and follow the same procedure three to six times. Drop lunges are done to loosen up the hips. Start with your feet together and place your hands in front of your body like you are boxing. Step back behind your body at an angle with your left foot. Come into a squat, come up and bring your foot back to the starting point. Step back behind your body at an angle with your right foot. Come into a squat and come back to the starting position. Go back and forth three to six times. Arm crosses help to loosen up the chest and rear shoulders. Stand with your feet about shoulder width apart and your arms out to your sides with your palms down. Extend your arms behind you and then cross them in front of your body. Go back and forth three to six times, then turn your palms up and repeat. Arm circles are another stretch that loosens up the shoulders. Stand with your feet about shoulder width apart. Extend your arms out straight to your sides and make small circles in both directions. Do three to six small circles, then repeat with medium size circles and large circles.